I got myself a rather interesting FDC issue from Australia Post. 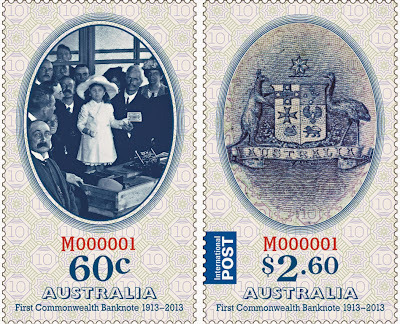 Coinciding with the World Stamp Expo 2013 in Melbourne, it became the feature stamp issued on day 2 of the expo. Malaysia had its own latest series of coins and banknotes commemorated through the issue of several FDCs, with the miniature sheets replicating banknotes being the most sought after and most eye-catching. Here though, instead of putting on the latest currency, Australia Post chose to commemorate the first paper currency the land down under issued, as well as the centenary of that issuance. The FDC itself is relatively unremarkable with the 2 gummed stamps, but the miniature sheet is another story entirely. The individual stamp set (above) and the miniature sheet (below). 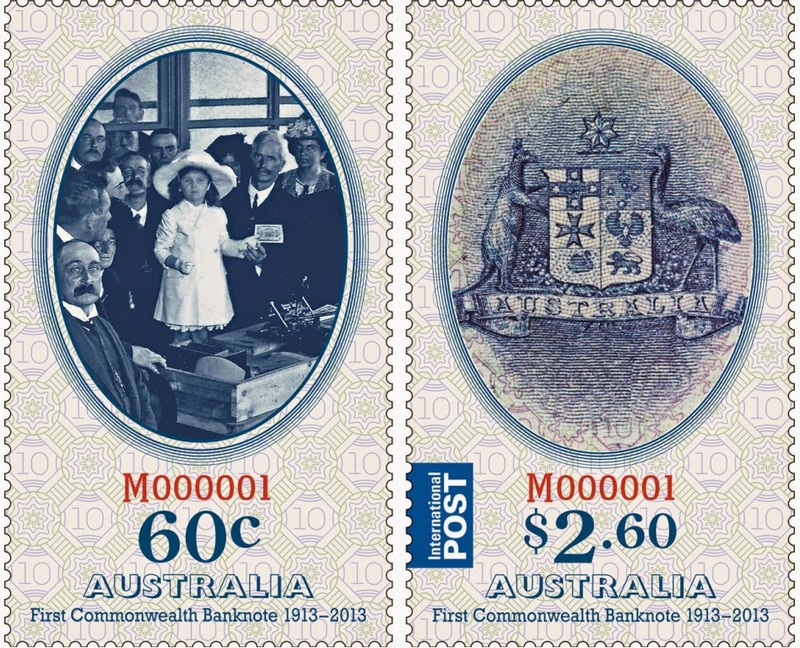 The image of Honourable Judith Denman being presented with Australia's first paper currency is shown in the A$0.60 stamp, whereas the Australian coat of arms is on the A$2.60 stamp (image taken from Australia Post). Prior to 1913, paper currency circulating in Australia comprised banknotes issued by trading banks and by one State Government. However, the Australian Notes Act 1910 had made it an offence for any bank to circulate banknotes issued by a State and withdrew their status as legal tender. The first banknote issued by the Commonwealth of Australia was a 10 shilling note bearing the serial number M000001. The official numbering ceremony of the note took place on 1 May 1913 at the government printing works in Flinders Street, Melbourne. The number was printed on the note, by means of a hand-operated press, by the Honourable Judith Denman, the five-year-old daughter of the Governor General, Lord Denman, who was given the note as a souvenir after the ceremony. The note is blue in colour and represents the Australian Coat of Arms on the front and on the back, the Goulburn Weir in Victoria, symbolising the importance of water for the country. The note currently holds the record of the highest price ever paid for an Australian banknote and will be a feature exhibit at the Australia 2013 Stamp Expo. This is how the first Australian state issued paper currency looks like (image taken from Museum of Australian Currency Notes).